Hey, turn around, guys! Guys? Alexis Sanchez is 3 feet tall. That’s my takeaway from the Brazil/Chile game I attended last night. Alexis Sanchez is 3 feet tall and so fast that when he runs his legs spin around in circles like the Roadrunner’s. Meep meep! Seriously, though, Alexis is tiny! I knew he was the shortest guy on our team, but until you see him close up standing next to Maicon you don’t realize just how wee he is. He’s sure strong, though. I saw him bull his way straight through several much larger defenders. And my favourite moment of the entire game was when he successfully tackled David Luiz. Ha! I wasn’t originally planning to go to this game. I mean, I don’t support either Brazil or Chile, the tickets weren’t cheap, and it was on a cold Tuesday night in November. Plus I hate crowds, like really really hate them to the point where it causes me anxiety problems if I get stuck in one. So, no. And Dani Alves was injured and wasn’t going to play, which was half my reason for wanting to go in the first place! But then I realized that I may never have a chance to see two teams of this quality play again, or at least not for many years, and I would get to see some of my favourite players. So I not only decided to grit my teeth and go, I splurged on a really good ticket smack dab in the middle of the lowest tier, with an excellent mid-pitch view. Then I started to get excited. Alexis! Neymar! Dani Alves! Maxwell! The game was played at the Skydome*, which is not normally a “soccer” venue. They brought in real turf specially for this game, but as many of you noticed on your screens it was not ideal. From my vantage point the pitch looked very dry and slippery, and large chunks of turf were frequently becoming dislodged and had to be tamped back down. I could actually hear Xavi crying in Barcelona. Pretty embarrassing that my city couldn’t provide a better surface for two world-class teams. Also, I don’t like the Skydome. The seats are uncomfortable, and with the roof closed it has an odd “flat” sort of atmosphere more suited to a concert than a sporting event. On the up side, it’s only a short streetcar ride from my home, so I’m glad it was there instead of BMO Field. Of the game itself I can say very little. I’m sure many of you watched it yourselves. Someone on twitter said that they thought the pace was quite slow, but I can assure you that when these finely-tuned athletes are dashing around in front of you, they seem very fast indeed! Although it was only a friendly, both teams came out to play a serious game, turning out the best lineups available. I was especially interested to see Thiago Silva play, as I have never really followed teams he has been on, and the Barça board/coaching staff seems to think he is the perfect CB for us. I thought he played an excellent game, but I have to admit I don’t see what exactly makes him potentially excellent for *us*. And of course there was Neymar. When his name was announced the crowd gave a gigantic roar. He was the man everyone wanted to see. (Alexis got a big roar, too, only slightly smaller.) Neymar is just as skinny up close, and looked a bit scruffy and tired. He didn’t do a lot in the warm-up session, in fact he sort of disappeared for a while. Not to worry, though, he was bright and ready by the time the game started. He rampaged straight through the Chile on numerous occasions and had several opportunities to score, but couldn’t quite get a decent shot off. One thing I noticed about Neymar is that he didn’t track back much, but to be fair, with the NT he is not asked to. The Brazil defense doesn’t push nearly as high as we are used to seeing with Barça and they prefer him to stay forward to be available once the ball is recovered. In contrast, Alexis was literally everywhere for Chile. He was wide, he was in the middle, he was tracking back to recover the ball deep in his own side of the pitch. He was a human dynamo. If he wasn’t running he was lurking near the Brazilian box trying to find an inch of space to move into. Unfortunately, wherever Alexis went he was closely shadowed by Maxwell. Remember Maxwell? He of the pretty hair and the endless debates as to whether he was a better defender than Adriano? Well, I can tell you that he is still a very good defender, and gave Alexis all kinds of trouble trying to get away from him. I tried to get a good picture of them together, but they just wouldn’t stand still for me. How rude! Other impressions: Hulk has the weirdest little stumpy bow legs, I can’t imagine how he can run as fast as he does. Robinho pissed me off by playing rather well. The rest of the Chilean team wasn’t much taller than Alexis. What’s the big fuss about Gary Medel? He was OK. Chile are an all-out attacking team and a lot of fun to watch, like a swarm of ants overwhelming a grasshopper. The Chilean goal was awesome– Julio Cesar didn’t know where to look! Watching a game without a play-by-play was strange at first. And the woman who announced the goals and subs sounded disinterested and robotic. They really could/should have done better there. Jumbotrons are confusing. Did it look to you like the Chilean keeper was wearing blue? Because that’s what the Jumbotron showed, but he was wearing purple, and not even a bluey-purple. Just purple. $10 is way too much for a tall can of beer. *Edit: I refuse to call it the Rogers’ Centre. Nope! FIFA definitely is JOKE. They extended the voting just because Ron did well against Sweden. If he was such a phenomenal player why was Portugal playing the play offs? Especially in a group where they were the best. Thank you, Blitzen. Sounds you had a great time. I’m happy for you! Dani is also out for 7-10 days. Thank you Blitzen. Typo bad Dani Alves didn’t play. This was fun … wish I had been there with you! ALEXIS: Hey, didja see this? We made BFB, bro. NEYMAR: First Ray and Phil, and now us! Who knew? ALEXIS: I know, right? Look, here’s some “pix”, as the kids say. NEYMAR: No way, that’s you and me! Pin that sucka. ALEXIS: She says you don’t trackback, man. Not like me. NEYMAR: Yeah, well, she say you got a smaller “hooray” than me. NEYMAR: ‘Cause you’re so small, dude. ALEXIS: I don’t see a shot of your cute buns anywhere on here. NEYMAR: Really, really small. Like, SHORT, bro. ALEXIS: You know who’s gonna be pissed he missed this, right? NEYMAR: Yeah, let’s go rub it in! i was also happy to get news from Toronto that was not about *that* mayor! on another note, dani alves is out 10 days! here are our players that are in various states of injury! Oh, they did. I’m fine when I’m in my seat, but getting up to use the washroom at HT was extremely unpleasant, and getting out of the stadium at the end and onto a packed streetcar was horrific. I was pretty much shell-shocked by the time I got home. I’m still mentally exhausted two days later. Still, it was worth it, even if at times it didn’t feel like it. I made it home without punching anyone in the face, so it’s all good. 😯 Wow, that’s quite something. i forgot, Tello is also a doubt for saturday. that’s a big list. What is the exact reason for the Ballon d’Or voting to be extended? Didn’t all the voters submitted their votes in already? What’s going to happen now? FIFA will send them a new form or ? Really confusing. Will people really change their votes? I really doubt it. I do think that whoever player performs really well in the voting month and the one before will always have a higher chance of winning due to the media exposure which in this case is clearly Ronaldo. I read somewhere that he wasn’t planning on attending the ceremony. I wonder if he will change his mind now that he has the highest chance of winning. The official reason was a low voter turnout. I suspect that the real reason was that they didn’t like who won the award with the votes that they in fact received. FIFA is a joke, were it not that they control the sport we all love. Anyone heard the talk about Sanabria wanting to leave? I suspect that it’s his agent whos been whispering stuffs in Sanabria’s ears in order for him to get a fat pay cheque pretty soon. I guess he’s getting impatient and greedy as with most of the agents. I really think that there is a high chance of Sanabria failing. He shouldn’t move at this stage of his career. He still needs to be developed further. I’m not saying he will 100% fail but there is a high chance that he will. A lot of the young guns who leave too early thinking that they’re too good and want first team action and more money, will fail. What a pity if he will be one of them. sorry, who is sanabria? is he at FC Barcelona? never heard of him/her. He is a 17-yr old Paraguayan youth player who has been at Barça since 2009. If we are to believe what has been written during the last couple of days, he is apparently ready to leapfrog Jean Marie Dongou. However, various EPL clubs are more than willing to pay his release clause of 3M and offer him senior squad status to boot. Apparently the boy is tempted, although his father declared that it is not about the money and that his son wants to succeed at Barça. At any rate, Tata and Zubi are trying to convince him to stay. His agent and camp are doing a Krkic. If he wants to leave, let him. Earn your playing time, earn your spot. I confess to not having seen enough of him to know whether he is in fact ready for first-team status for anyone. But I know that he isn’t for us, or he would have that status. Bagnack and Dongou are about to be renewed. More are to come, I am sure. The scourge of auto-promotion has to be stamped out. The first team should be moving along two of the most talented B players. No more. 3M is not bad for a youth player. More than we will end up getting for Krkic. Then again, how much did it cost us to get Piqué and Fábregas back…? Sanabria has made 5 appearances with our B team. I like him, but he is nowhere near ready for promotion, and currently not good enough enough to be blackmailing the club into guaranteeing it. Show him the door, take the 3M, and let that be the end of it. As far as I can remember D. Suarez has a guaranteed promotion next season in his contract. Anyone else? The latest El Classico in improvised Camp Nou in Indonesia. @barca96 – I suspected that FIFA would do something this time, ever since Blatter’s stupid remarks went public. The word is that at the end of the initial voting deadline, Ribery and Messi was ahead of Ronaldo. Once Ronaldo scored in the first leg of the play off, they might have decided to extend the voting line and also suggest the reason of low voter turn out. Since there was no issue of low voter turn out in the past years, it is quite intriguing why this happened this year. (It will be interesting to see if FIFA will publish the first set of votes) Blatter desperately needs to save his name amongst the many screaming journos and of course Ronaldo, who really did well to take the chance in the second leg. More journos are routing for him now. The worst part is that, it has all got into a rotten mess, and even a thinking child can make out what is happening. Even if Ronaldo wins now (because of his performance for 3 months – as some argue! ), there will be shades over it, and that is quite sad. Blatter unintentionally didnt do any good for Messi, and now he is not really helping Ronaldo too. What a mess. My words are – in a normal situation, most players and coaches are always going to pick Messi, even if he plays only 3/4 months. It is the journalists who brings in other factors to the voting process. And from what is happening around, ever since Blatters’ remarks, it seems journalists – especially UK ones – are trying hard in influencing the opinion of players and coaches as well. This could be one year in which no Messi fan would feel bad, if he dont win the award, but see how its working. Very disappointing. I read a comment somewhere that players and coaches from around the world just vote for popular choice – I would say that is very disrespectful to those players. Because they come from a poor country or a country poor in football – like my India – doesnt mean they dont follow or are not informed about what is happening in the football world. Many of the Indian football players (yes from my Cricket crazy India) are Barca fans and follow our games. I dont think there is any pro player who will not care for what is happening in the football world. Give Penaldo the Ballon d’or so he could stop crying, am tired of his crying already! Scares me every time the players come to the States or Canada because the pitch is usually an improvised sod over plastic temporary kind of thing. I’m thankful there were no serious injuries. To me, the ball seemed to move slowly on this surface even as the pace of the game was quite fast. So on to the next game with Pinto and 10 other uninjured players (are there 10 other uninjured players?) with the best injured XI (or so) the world has ever seen sitting in the stands watching (fidgeting, throwing peanuts, texting). Both Pique & Cesc have been declared fit. And Barça B forwards Dongou and Adama Traore have been included in the squad for tomorrow! Cuenca still needs more training time, Tata says. This Barca B callups somehow spice things up. I’d be happy to see Dongou continue his good run from the preseason with the first team. I guess Tata will favor midfield stability with Busi, Iniesta and Cesc and put some young motivated guy, flanked by Ney and Lexus in front of them. It’s going to be interesting to see our starting XI tomorrow. It could be experimental considering the injuries and the international break. Montoya – Bartra – Masch – Adriano is the back four I would pick as Pique isn’t 100% and Puyol can cover a full back position if needed. Song – Busquets – Iniesta in midfield as Cesc is only just coming back and Sergi Roberto isn’t often trusted. Alexis – Neymar – Pedro up front with Dongou and Adama on the bench is fairly dynamic and should be enough to get us a few goals. Literally the day after Messi was quoted as saying that his life is in Barcelona and he never wants to leave. Why do you think it is ‘notable’? Given the reliability of some (all?) of this guy’s other claims, it seems to me that he’s simply trying to get his picture and name in the papers/web. Neymar will leave us before Messi. Blitzen, I also have anxiety issues, mainly in a crowded place or in the car in a heavy traffic (when it’s really horrible) and the worst, when flying (aeroplane). I’m on medication. It’s effective for daily life, but there are certain situations I just don’t put myself into. 11 first team players are injured!! Now I know we had some staff changes but don’t tell me that none that stayed back didn’t learn from the previous staff? Another thing is, I know Juanjo Brau was promoted but didn’t anyone else took note of his method or couldn’t Brau pass down his knowledge to the new ones? Many people are saying that the voting for the Ballon d’Or wad extended because FIFA didn’t like the initial outcome which is Messi on top. But, but, what if it was Ronaldo who won it and as we all know, Blatter prefers Messi, so he extended the voting hoping that Messi or Ribery would win it. And if you think about it further, it could also be about saving face (Blatter). If Ronaldo wins it, it’ll make Blatter look bad after his infamous admission at the university. Now Ribéry is out for how long? with a broken rib. If we are cynical, which we are not, we might wonder how this will affect Ronaldo’s chances. Ah, the controversy! The conspiracy! The madness! Haven’t been here in a long long time. Although there isn’t a better time to pop by than to read blitzen had a blast enjoying the game (and Alexis’s abs). Glad you had fun, blitz! Also good to see this space is just as Ballon D’or conspiracy happy as the space i run. Won’t someone stop the madness? Bassam has come back to us! Ah, but Bassam, the Ronaldo question is only posed if we are cynical. Which, of course, we are not. I wouldn’t say that there is a FIFA conspiracy. It’s not like Jorge Mendes sent out a series of little yellow minions to yank on Messi’s muscle or kick Franck in the ribs when the camera was poised on a particularly photogenic hottie among the fans. And it’s not *quite* a popularity contest either. Does everyone like Cristiano because he is a personable young fella, or does everyone like Cristiano’s chances because he is a force of nature? Bassam, how do you see Madrid this season? The B d’O is a complete joke and a shameless popularity contest that has lost its credibility. You don’t need to look for any evidence for this any further than Diego Simeone’s blatant exclusion even from nomination and the fact that a Xavi Hernandez has not been able to win this award despite his consistent stamp on world football for half a decade now while being the chief architect of world cup, Euros and Champions league winning sides. That is the real travesty. Granada don’t concede much but then again they haven’t played us yet. He was a threat constantly but often took too many touches. He missed a couple of chances too but he was really dangerous in possession. That match was one of the best I’ve seen in ages. Well, maybe most exciting is a better term to use than best but it was great to watch. It’s a shame none of Iniesta’s through balls ended up as goals, but you can’t complain about a 2-0 lead at the half! I have to say, I’ve only one problem with Tata and it’s that he never makes early substitutions even when the match is won. That was one heck of a match!! End to end stuff. They just never give up. I don’t know with Deulefou. Never been impressed with Deulofeu and certainly wasn’t impressed with him just now. Every time he gets the ball, it’s dead. He always chooses to go solo even when he can play the ball. Nearly every time! You can see the look on his teammates. There was this one rare successful dribble towards the end, he should’ve squared it to Lukaku but surprise surprise he takes a weak shot from a tight angle. Unbelievable. I watch Everton to watch him but it’s been a handful of matches now and it’s the same as whenever he plays for Barça 1st team. Always tries to dribble even when a pass is a better option. Doesn’t matter how many defenders there are in front of him. I know a lot of people fancy his drilling but I’ve not even seen a handful successful dribble from him. It’s a different story in the youth division or Liga Adalante though. I just feel that he hasn’t figured out that he’s playing against senior professionals now of a much higher level. Hopefully he won’t be a Bojan case where he was the man in the youth divisions but a baby with the big boys. Speaking of Barça cadets, that was a nice debut from Adama Traore. Hopefully Tata has realised Eusebio is a turd and will try to give opportunities to deserving young players himself. People. Once and for all, there is no Ballon d’Or controversy or conspiracy. But it’s funny how nobody said anything when voting ended 8 weeks before the ceremony, in a move that can only make Messi look a better candidate, and no conspiracy theorists raised their hands then. BdO is a simple, goal-driven popularity contest that means feck all at the end of the day. Ask any player worth a damn if they would rather a championship or a BdO, and see what he says. What has given weight to the theories is a silly little dance done by a silly old man, and the fact that because FIFA is a corrupt a batch of trolls as you will ever find, suddenly anything is possible. Folks need to quit. Today’s match was a delight. The seeds of the beginning of a bit of speculation that perhaps, just perhaps, Messidependencia was coming to an end were being sown last season. This season, as Messi was less than his best but the team kept rolling, those notions were taking root. Today, as the team dispatched Granada 4-0, maybe it’s time to start harvesting some fruit. Now. To say that a team doesn’t need its best player to win is different than saying the team can win without its best player. Neymar is such class, and makes a huge difference in the team’s ability to deal with life without its best player. And it’s reassuring that we have the Copa and all but meaningless CL matches, so that Martino can really rotate, and save the big guns for the Liga matches. The club got two penalties today. I liked that because it means the team is making plays in the box that force defenders to make poor decisions. Nice. i think ronnie feigned his injury just to remove “ronaldo cannot beat a fit messi to the bdo” from everyone’s mind. and is probably mad at the medical staff that termed his injury as a “minor knock”. but the truth persists(see ronaldo’s former win)… and messi taking time out to write off berba, praise ozil, rvp and robben, at the the sametime applauding suitors, while professing his undying love for barca, is all a publicity stunt to not be totally blown away…only ribery seem not to be making an effort…and no, the bdo is of paramount importance as any other team trophy…visca barca! Except that the Ballon d’Or is fundamentally an individual award that sometimes makes players do uncharacteristic things beCAUSE of the goal-centric reality of that bauble. The bummer is that we can’t do a poll, to ask all players if they would rather hoist the Champions League trophy, or the Ballon d’Or. I would bet my house that the ones that could stop giggling long enough to answer, would say Champions League. Individual awards are for fans to bicker over, and players to boost their salary demands. And that’s up to, and including pichichi. It could be argued that the Zamora is an individual award that is in fact a team award, because a keeper is mostly as good as the defense in front of him. That is, enough good chances and ANY keeper will concede. But Ballon d’Or finds players taking shots when they should be passing. Pichichi finds teammates passing to a player so that he can take shots to score goals that will help him in that competition. Further undermining the credibility of the Ballon d’Or is that the votes are made public. Knowing that, think of how many coaches and/or players will vote for locker room harmony rather that the “best” player, assuming such a thing can be adequately quantified. Some players, like Mascherano, don’t vote. That way, they needn’t bother with any stress. Other vote for teammates or countrymen. You think Pepe is going to cast a vote for Messi, or Iniesta for Ronaldo? Doubtful, particularly in light of the votes being public. It’s just my view, but individual awards pale in comparison to championships, the ultimate in team accolades. And dont think this locker room harmony is any big thing. Inspite of being in a team with Zlatan, see who Thiago Silva voted for. A lot of players, inspite of being in a team who had players within the 23 nominees have often voted for Messi or Ronaldo or Iniesta. Can’t remember ever seeing Bartra beaten one-on-one. Always seems to have good balance and footwork. That really counts for a lot. How about during the previous game? This time around he looked a lot more solid. Err … me-apologies asking, hombre. Are you FlashRat in the Guardian Barça Blog? Blinding semblance in your comments and tark. CR7 is brilliant dude…and as to why he plays the way he does? its because madrid depend heavily on individual brilliance, madrid are always a club of extravagance, Ronaldo plays the way he does because he has to, he is totally justified by the total amount of goals he has scored thus far, Ronaldo would have been an absolute dominator if only that certain 26 old argentine hadn’t been raised in our farm! kxevin, it can be argued that intrinsic motivation beckons upon the scheme in play, the balon d’or is just another way to make teams more competitive while procuring or nuturing those who attain a certain level of brilliance that is deem fit to lift the general morale of the team sheet, by porducing balon d’or inspired displays week in week out. Alot of people think that team accolades are superior to individual awards, but motivation ranges from one individual to the other, Ronaldo wants to win the balon d’or because he thinks he’s the best, mourinho wants the championship to further cement his legend, thiago sought after playing time because he wants play a huge role in the WC, neymar came to FCB because he wants to play alongside messi, who in turn wants to win every other trophy. you can see from the above that individualism is pretty much what makes up a team. you can not say every team wants to win the champions league, while not every player wants to win the balon d’or…logical is it?…And you talked about hypocrisy, as to who votes for who and why, we all know that only two names pops up when such prizes are brought up….and ofcourse a third person with 0.00% chance to win it, its pretty much a routine vote, iniesta/xavi/ibrahimovic/cassilas can easily rack up votes from fellow country men because their brilliance is there for all to see, country men bias is only likely to occur when the player in question falls completely short of any sort of brilliance, i don’t see arbeloa getting any country man favour if he for an unknown purpose made the short-list, truth is proximity matters alot, you could see that even with neymar’s brilliance at santos(which is really brilliant) it took him a move to europe to fully stake a claim that he belongs with the big boys, because at santos nobody saw him week in week out, and the heart duly grows fond of consistence. 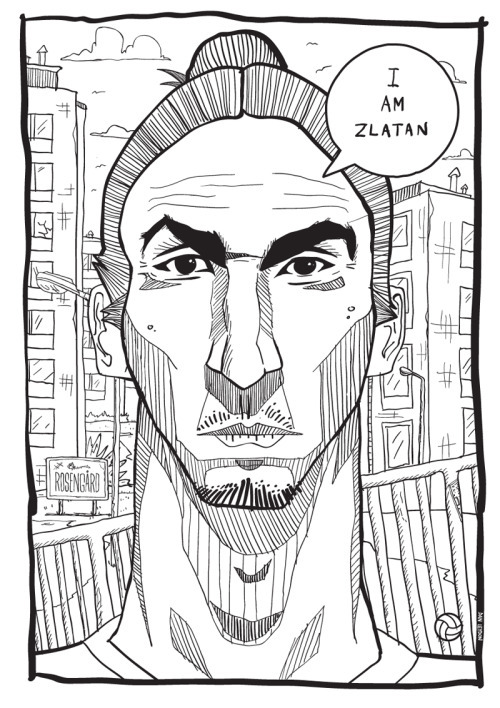 so if i’m in the swedish team and i get to see ibra train and play competitively and produce scintilating performances his vote becomes a no-brainer for sure. the biggest hypocrisy is to place a player in the spotlight and expect him to make individual calls. e.g kxevin: balon d’or or champions league?. kess: hahahahaha(wtf!? )hahahaha champions league(coz my teammates are watching). Great post Blitzen, glad you had a great time! On another note, I genuinely don’t understand how people find it hard to be objective about this sport. I get it, you support Barca, but for crying out loud, please at least try to recognize talent when you see it. Ronaldo has been better than Messi this year. Period. Stop making excuses for Messi. He performed brilliantly, but he was hampered by injuries. Ronaldo performed brilliantly too (more so). Why try to take away the shine from his performance to sate your need to defend Messi? And please stop constructing conspiracy theories inside your head. Show me actual solid proof, then make claims. Why must we insist on concocting these ridiculous theories to further our beliefs that the world is against us? Please stop. Be logical. Believe what you see actual undeniable evidence of. Sorry for the rant blitzen. Maybe b’cos they are barca fans. I don’t see any reason for a barca fan to praise Ronaldo,whether he ‘s been better than Messi or not(this year). Thats the problem here. You think praising Ronaldo for his qualities creates a doubt on your allegiance to Barca. That to me is an unbelievably shallow thought. Well, there’s no need to praise him, and we will probably never do that, but it’s another thing to recognize and admit that the guy has been on fire the last 2 months. And, he can go and win few of them in the row and be praised, but he will never be Messi. Im a die hard barca fan and will always be; but Ronaldo clearly deserves the award and is an absolute marvel of a player. Dont put club loyalty ahead of grace and clear thinking. Lets acknowldge a great player when you see one. Ronaldo is in a lot of technical catergories better than Messi and his form this season is god like. We all love Messi and we all have an issue with Madrid, sure, but cmon – lets acknowledge talent and what Ron deserves after this calendar year. @Iamxavi6, and what would those ‘lots of technical abilities’ be? Shot power, heading, sprinting speed. Messi is better at dribbling, creating and probably more clinical (not sure this season, but has been in seasons past). Every player has his specific qualities. The main point here is to be objective about them. Those are physical traits, not technical ones. Enough talking about the ballon d’or, does anyone want to talk about the match yesterday? If you don’t want to talk about it, don’t talk about it. If you don’t want to hear/read about it, skip over it. Simple. No need to tell people what not to talk about. Ballon d’Or is a hot topic now and surprise surprise, it involves a Barça player. So it’s only natural that we talk about it. I know it’s an individual award, but it does involve a Barça player. Or do you people who complain only like to talk about it when a Barça player is a favorite to win it? I can’t remember such issues for the past 3-4 seasons here. We used to be able to discuss it freely without anyone trying to put a stop to it. Ronaldo, yes is good, he scores bucket loads of goals. I give him that but check out his success ratio. It tells a whole different story but many fans don’t consider the success rate as an important data. I said this before, a few weeks back or so but some people was irked by the talk of Ballon d’Or but I didn’t want to reply and mess things up. Anyways, it seems that my question then is answered now. People, fans and journalist (most) only use the last 2-3 months before the voting as a yard stick. Whatever the player did before that is forgotten. Was Ronaldo such an outstanding performer before the season started (basically January to May), NO. Ribery was and still is an important figure for Bayern. Not only was he important but he won a lot of trophies too, something that Ronaldo doesn’t have, any! Ribery is and still is my favorite. I wish the voters would consider their importance and trophy haul instead of popularity and friendship or team mates. However I doubt that he can win due to the popularity and exposure and media backing that Ronaldo has. What’s yours if you would like to share? Iniesta was amazing last night. I don’t know what happened to him during the international break but he got his mojo back. He skipped past defenders with ease, something he had a hard time doing this season. Busquets probably had his worst match since his debut season. He looked a few paces off, so lethargic. His mind was somewhere else. It was refreshing to see Sergi Roberto getting a decent playing time. He really could do with playing time. So energetic! Isn’t it strange that Adama got a match time with the 1st team before the B team? That’s an indirect slap to Eusebio’s face. That’s how I see it. Eusebio can’t seem to recognize talent. A few other players I would like to see getting playing time with the 1st team (especially those who are not appreciated by Eusebio); Samper, Dongo’o, Espinosa, Grimaldo, the Portuguese pair, Sanabria and Babunski who both are internationals already. I was very impressed with 2 Granada players (can’t remember their names but both have Arabic names) especially the one who is their LW. His competitive international goals, only four in eight matches prior to the Sweden games, had come against Northern Ireland and Luxembourg. It was this failure to score in crucial qualifiers that helped ensure that Portugal were left in the playoffs . glory against Atletico Madrid — a rival that Madrid hadn’t lost to since 1999. One of the few things the Ballon d’Or criteria do specifically emphasize is” performance in big matches.” (Trophies aren’t specifically mentioned.) Though I’m very far from “against” Ronaldo winning this year’s award, I’m shocked by the number of people, fans, journalists and professional football people who say he’s the outright World No. 1 for 2013 largely because he has been white-hot since September .